On March 12 Indonesia celebrated Hari Raya Nyepi — the Balinese “Day of Silence” — a national public holiday. My campus was completely empty because of the occasion, save for the friendly security guard keeping post at the school’s front gate. To pass the time, I hired an ojek — a motorcycle taxi — for the day to take me around Palembang with the stated goal of capturing everyday life in the dense, sprawling city. I returned from Kemaro Island and parted ways with my new friends. My next destination was Bukit Seguntang, an enclosed grassy hill said to own the highest point within Palembang. As an obvious foreigner in Indonesia, it is at times difficult to snap authentic shots of people without them noticing, looking at you and posing for the camera. Still, a posed portrait can offer a glimpse into a person’s life — and sometimes reveals as much about the subject as any candid photo. 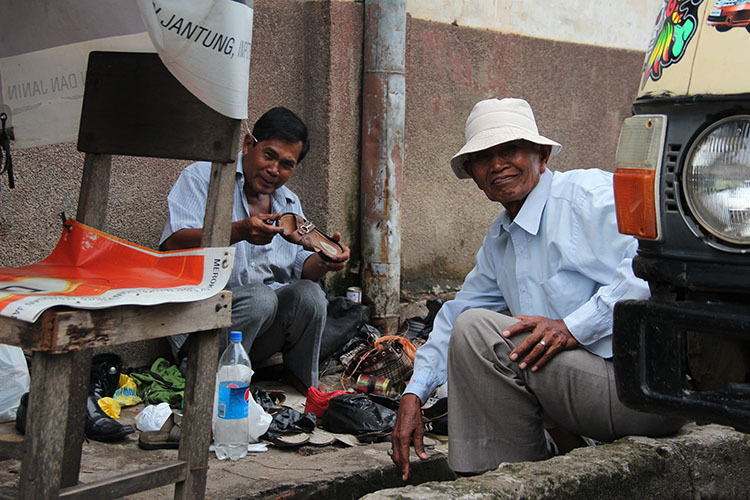 Shoe peddlers near a dock on the Musi River pose for a photo. 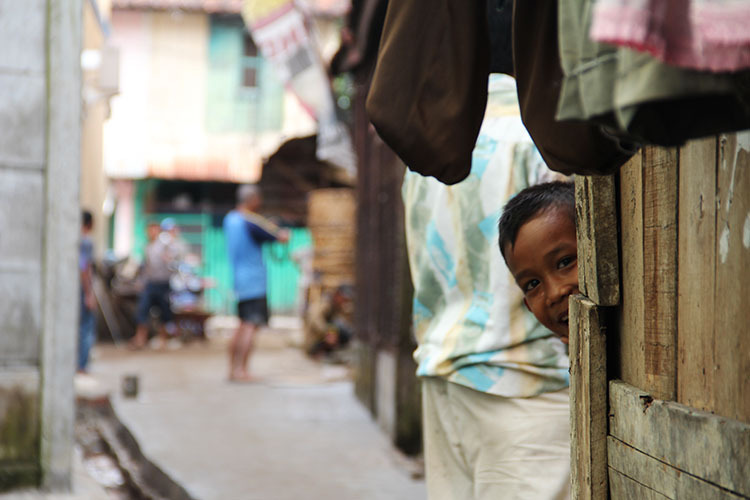 My ojek driver’s shy nephew peeks his head out from behind his family’s wooden shack at the end of a side street in Palembang. 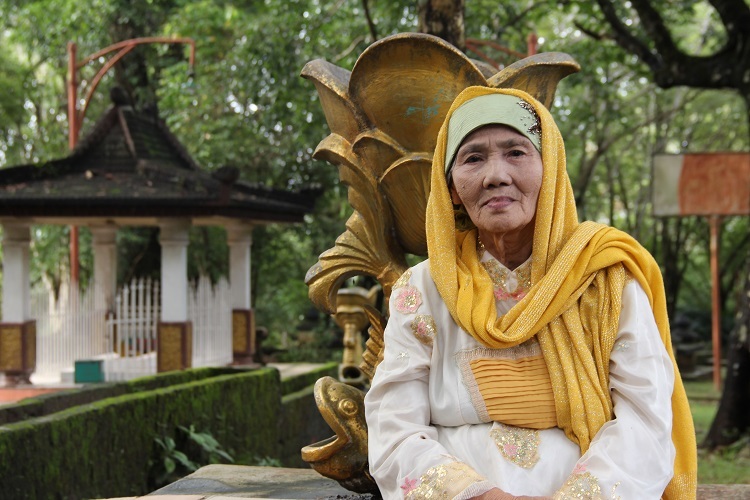 A woman sits outside the tomb complex atop Bukit Seguntang in Palembang. A man stands outside an ancient royal tomb in the garden atop Bukit Seguntang in Palembang. About the author: Dustin Volz is a Fulbright English Teaching Assistant based in Palembang, South Sumatra. He is editor in chief of Indonesiaful and a publisher of Downtown Devil, a hyper-local news publication covering the downtown Phoenix community. Volz graduated from Arizona State University in 2012 with bachelor’s degrees in journalism and history and a master’s degree in mass communication. Contact him at dnvolz@gmail.com. Just curious, what camera that you used? And yeah… shame on me as a local, but where’s Bukit Siguntang?